Have you ever looked at a world globe and wondered how it ever got to look like that. Well I can tell you for sure our world in all its evolutionary stages did not always appear as it does today, far from it and will change its face once again many times more before lights are totally out. Where once there was an oceanic seafloor under the long gone Tethys Ocean is now 26,000ft/7,925m above sea level alpine land in the Himalayan mountain chain supporting glaciers. From that supernova burst and accretion of its blast debris, Earth had parked in its own solar system revolving around an infant star as just evolving from the womb of its protosun stage some 4.6 billion years ago (bya). In its initial own infancy Earth was void of its oceans and had no companion as its satellite the moon was to come later. Studying isotopes of elements embedded in Earth’s earliest mineral accretions detect a gestation period of 50-100 million years before our home was fully formed. But in this initial infancy, Earth was primarily a mesh of molten minerals and metal and smaller than it is now. The denser metals sank to the core while lighter material raised more to the surface as Earth gradually cooled. Around 4 bya felsic zircon crystals were formed from the earth’s crustal cooling that have now been located as deaggregated and redeposited sediment in Western Canada’s Canadian Shield and in Western Australia’s Jack Hills region. Ranging from 0.1mm to several centimeters in size, zircon or zirconium silicate is extremely hard and with its chemical inertness and tetragonal crystal structure can endure erosion, metamorphism, magma and redeposition into other sediment material. Zircon has survived a very long journey. The main elements that clue us to Earth’s formation come from compilations rich in aluminum and calcium that formed during the solar system’s infancy of accretion. Today, these two elements can be found in meteorites as inclusions embedded in carbonaceous chondrite. Meteorite inclusions are more known in their euphonic form as CAIs for Calcium-Aluminum-rich Inclusions. These inclusions found in meteorites prove to be 50-100 million years older than Earth. Earth’s very infancy is known as the Hadean Eon ranging from 4.6-4.0 bya. It was so named by American geologist, Preston Cloud (09/26/1912-01/16/1991), for Earth during this period had a molten to a slightly cooling surface, was full of raging volcanism, choking gaseous fumes with nothing but steaming water not yet able to condense. It was a time of incessant bombardment along from micro-dust to much larger accreted solar system bodies. In being such a hellish environment, Cloud decided Hadean for Hades would be an accurate coining as Earth truly was in this eon a vision of exactly what we imagine Hell to be. Cataclysmic chaos ensued during the Hadean Eon. In fact, the first half of the Hadean Eon is called the Chaotian Eon as classified by NASA scientists. They also call the very earliest portion of Earth solar nebula formation as the proto-planet, Tellus and once the proto-planet Theia smacks into Tellus, in which we’ll discuss in the next chapter, they then call the two proto-planets as combined…Earth. After 500 years of its accreted formation, Earth’s original hydrogen and helium atmosphere was lost to outer space as these two lightest elements reached escape velocity due to the extreme heat in Earth’s molten state. Earth could though, support an atmosphere with its mass gravity holding down all heavier volatiles that were liberated as gases from the collisions. Breaking gaseous prisons as locked interstitially between impactor grains and held under Earth’s interior, volatiles began forming the atmosphere. But it was not mainly methane as was once perceived. In veritably, as found in dissolved gaseous compositions in deep crustal or upper mantle magmas, the atmosphere first leaned more to an oxidized state rather than reduced tied into compounds such as water, carbon dioxide and sulfur dioxide. The total percent of free oxygen radicals although were much lower at ~3.8% than now at its current 21% make-up of the atmosphere. Nonetheless, as nitrogen is chemically inert, free nitrogen was already becoming the main component of Earth’s atmosphere and later to become the Earth’s first elemental recycle. As mentioned, Earth during the Hadean Eon was constantly being pummeled by extra solar debris. All kinds of heavenly material were raining down from the young solar system pulled in by Earth’s gravity tug. 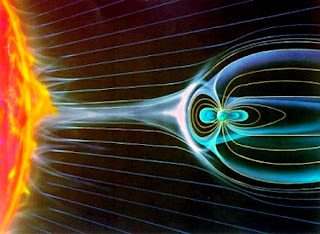 Solar winds as irradiated charged particles generated from the sun’s upper atmosphere were smashing at will at supersonic speed into Earth as the magnetic field was not up and running yet, which deflects most of today’s solar winds. Grain sized dust to comets composed essentially of ice, a bit of dirt debris and rock pebbles continuously showered Earth’s surface. Comets were to be a great water source for Earth’s later forming oceans. Meteoroids, basically leftover small debris objects orbiting through the solar system’s interplanetary space are no bigger than one meter (3.3 feet) in diameter with solid mass composed mainly of silicate rock where around 6% are dense iron/nickel. As meteoroids fall through Earth’s atmosphere they are termed meteors whether surviving landfall or not. For those that do not burn up in the atmosphere and hit land, they are known as meteorites, which under analysis have told us a lot about the early solar system’s composition and timelines. Asteroids are essentially meteoroids on steroids. They are much larger bodies primarily with their own orbits and may be considered as minor planets being a few hundred meters or miles in girth known as planetesimals with the largest ones in inner space further called planetoids. Composed mainly of mineralized stone and metals, some are carbon rich and indeed during the Hadean Eon, many asteroids that smashed into the infant Earth planted their organic seed…the basis for all Earth’s life. 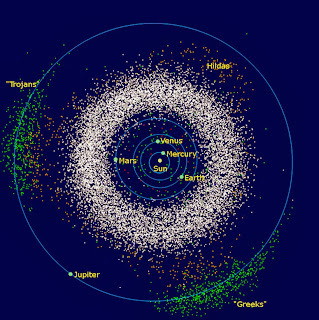 Most asteroids remain in the asteroid belt between Mars and Jupiter and were evolving as they were accrediting into planets or one enormous one. But during Jupiter’s formation, its strength in mass during orbital resonance impacted planet evolvement in the asteroid belt ejecting 99% of the planetesimals from the original belt region. 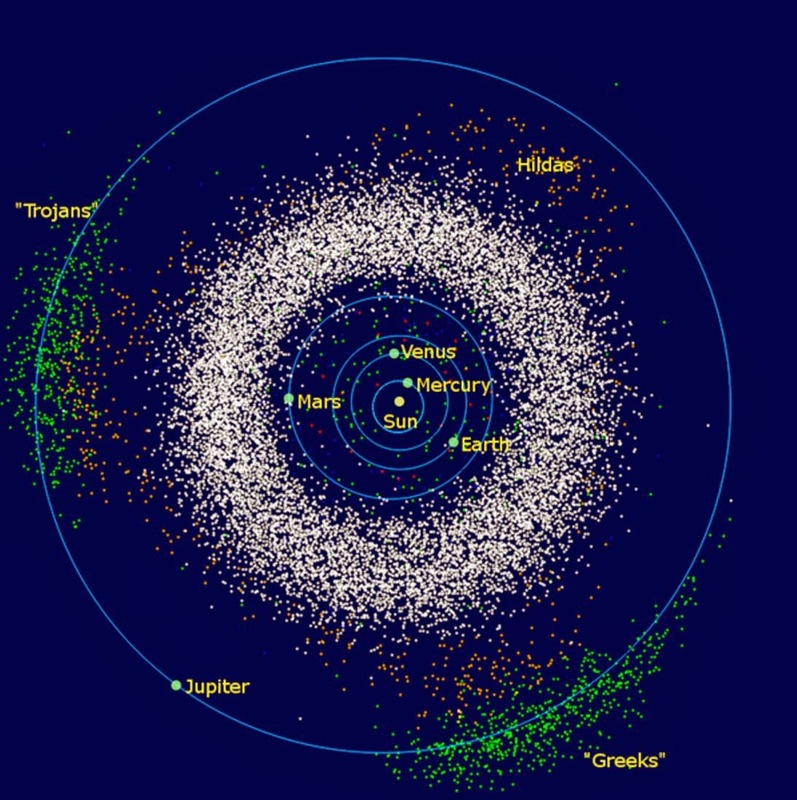 The three main ejected asteroid belts have names known as Greeks, Hildas and Trojans. There were many asteroids ejected further away from the belt into inner and outer space. The ones ejected into inner space are the ones that have and may still hit Earth. Within the belt itself, orbital resonance, which is a force similar to a parent pushing a child on a swing, caused collisions breaking the planetesimals into smaller fragments, but held them in situ about the belt’s current orbit never again having the ability to accrete and evolve into a planet. Some of the largest asteroids, bigger than 129 kilometers or 75 miles wide may have melted during this Jovian influence on the belt, but did not fragment, instead differentiated with the heavier metals sinking and the lighter rocky minerals remaining on the surface region. Still though, even today during Jupiter’s gravitational perturbations, a few asteroids in the Trojans conglomerate are tossed out of resonate orbit into an unstable renegade orbit that can collide with other celestial solar system bodies such as Earth. During the Hadean Eon, this was much more frequent. Amid the Hadean Eon’s onslaught of comets, asteroids and meteorites pelting and smashing into Earth, around 4.5 bya, a huge boulder about the size of Mars, named Theia impacted Earth. This smashup hurled molten debris careening in every direction. The initial collision did not totally annihilate the impactor mass as it was more of a glancing off center blow rather than a direct hit, but somewhat rebounded it back into sub orbital space about Earth for approximately a half an hour only to be drawn back in slamming into Earth once again. This time however, the whole of Theia was absorbed incorporating into Earth’s mass. Due to velocity statistics, the earth and moon’s gravitational flux towards one another, the fact that Earth was around half its current size with composition consisting primarily of the initial solar nebula accretion and along with computer simulations bearing it out, we know this is how the impact occurred. This impact was crucial for what the atmosphere was to evolve into. The impingement instantly vaporized a goodly amount of material creating a vapor of rock composition in the atmosphere. The so called rock vapor condensed within a matter of two thousand years dropping the solid mineral constituents while leaving behind the hot volatiles. This resulted in a heavy carbon dioxide percentage in the atmosphere along with a substantial amount of water vapor. The initial molten debris sent into space was first mainly from the Theia impactor. The second and final impact though, mainly hurled molten Earth mass outwards into space. The molten material began orbiting Earth in rings much like is witnessed by Saturn today. Around 22,531km/14,000mi above Earth, the molten material began accreting forming what was to become the moon, which took only a half hour or so. We know all of this due to the current angular momentum interacting between the Earth/Moon dance. Further verification of this moon formation is that most of the moon’s elemental and mineral crustal compositions are like Earth’s while oxygen isotopes found in both crusts are identical where other celestial bodies, such as meteorites, asteroids and Mars have differing oxygen isotopes much unlike the earth and moon’s. Other likenesses between the moon and the earth is that most mineral content in rock is not hydrated, but there is plenty of free water as found on the moon’s shadows in solid form (ice) or in water’s three forms of solid, liquid or vapor on Earth. The newly formed moon took only ten years to configure, but was still molten material. Due to remaining debris from the original impact of Tellus and Theia, the moon, with very little or no atmosphere, was constantly pelted by material being captured from its weak gravity. Once it solidified, it was further hit by incoming meteorites and asteroids kicked out of the asteroid belts by Jupiter. It appears the moon had a little sister moon forming as well about a third the size of the moon when our moon was a quarter smaller in size. Within 100 million years the mini sister moon smashed hard into the side of the lunar surface that never faces Earth. This smash up created the highlands that is nowhere else evidenced on the rest of the moon’s low plains surface we call Maria. The moon is not spherical and is certainly not circular, but is egg-shaped with one end pointed directly towards Earth and the other small end on the opposite side of the moon that never faces Earth. All this is due to Earth’s gravitational effects bulging the moon end-on-end slowing its rotation. 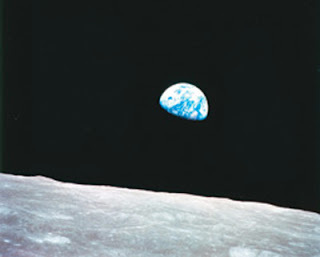 As mentioned, the moon first formed only 22,531 kilometers or 14,000 miles from Earth. Ever since its inception though, it has gradually been moving away going higher up in its orbit traveling 3.8cm/1.5in per year, where it is currently 384,400km/238,900mi in distance from Earth. In robbing some of Earth’s rotational energy, the moon is still scooting away from Earth where in another 4 billion years will only look like a big bright star from Earth. To end on the moon, we all look up into the night skies and see only one satellite of Earth’s greeting us, but in technically speaking, Earth indeed does have two satellites. There is an asteroid caught in the earth’s gravitational pull that is 4.8km/3mi wide known as Cruithne. Besides its small girth, another reason we never notice it is because its closest point in orbit to Earth is 12,000,000 kilometers or 7,500,000 miles distant. In having a fainter magnitude than Pluto, one would need a 320mm/12.5in reflecting telescope to image it. Though it orbits the sun in a year’s time just like Earth, its bean shaped orbit around Earth takes 770 years to complete. It appears though, Cruithne is merely a hitchhiker, for in another 5,000 years or so, it will be released from Earth’s gravitational grip as Earth pulls away from Cruithne’s bean shaped orbit. Towards the end of the Hadean Eon, the solar system began settling down. Earth’s surface was still an ocean of magma, but the hurling of celestial objects had settled somewhat enough to allow the earth’s crustal material to begin solidifying. 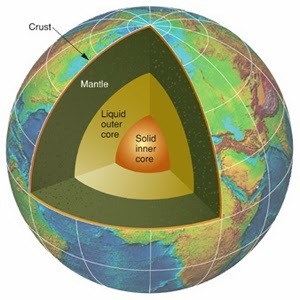 By this time with the sinking of iron and nickel, Earth had its patterned structure of a molten metallic core, a predominately solid silicate rocky mantle with a chemically distinct crust acting on the surface. 4 bya marks the ending of the Hadean Eon and the beginning of the Archean Eon. All was relatively quiet at this timeframe until 3.8 bya when a catastrophic event ensued directly from the heavens. We are just now beginning to understand how planetary formations and planetary orbits have a direct effect upon one another. We’ve already discussed the influence Jupiter had on the asteroid belt, thus affecting the whole solar system. Along with Jupiter, the other three giant planets, Saturn, Uranus and Neptune embarked upon an evolution of the solar system that was to abruptly change the course of the growing solar system. It’s called by astrophysicists the Late Heavy Bombardment. The four giants were originally formed together closer to the sun in very tight circles, with Uranus actually being the outside planet and one farthest from the sun. Further still, there was a dense comet belt stationed beyond Uranus. Being in close proximity, Jupiter as the largest planet, creates a gravity pump forcing Saturn closer to Neptune and Uranus. Saturn’s affected slowing orbital period around the sun grows to twice that of Jupiter’s. All this perturbation drives the planets into the comet belt’s proximity which flings comets in every direction until the belt was nearly depleted. Once the belt was virtually swept clean of its comets, Uranus and Neptune switch orbits ending the bombardment period, but forever changing the solar system’s and indeed Earth’s evolution. 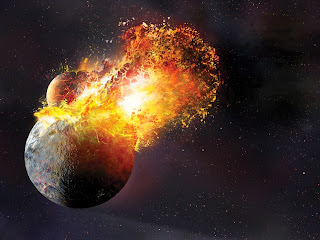 Although the bombardment lasted no more than 0.3 billion years, Earth and its moon were literally hammered by this bombarding event. The renegade comets brought an enormous amount of water to Earth and the moon where it froze on the shaded lunar surface, while it was held on Earth by its heavier formed atmosphere. Although due to the dynamism of Earth’s geologic features of subduction zones and volcanism, no extensive crustal cratering remains from this event. The lunar surface however is intensely cratered and the radiometric dating of the lunar impact melt rocks brought back by the Apollo missions bear it out. For sure the moon has been used heavily as a heavenly punching bag. Lunar (moon) mountains are not the result of orogeny but are rather from celestial impacts that have created mountains as tall as 2.25km/1.40mi. Lunar mountains took their permanent shape incredibly fast. Most were formed within ten minutes. For fun, in using a little bit of simple algebra, trigonometry, an astronomical almanac and a handy CCD (charged coupled device) camera, one can calculate lunar mountain heights right in the convenience of one’s own backyard. Throughout the heavy pelting of asteroid and meteoroid collisions and assuredly along with the Theia impact, Earth had garnered enough iron that during its molten stage, the metal quickly sank to the core and there an alloy of iron and nickel make up the composition. 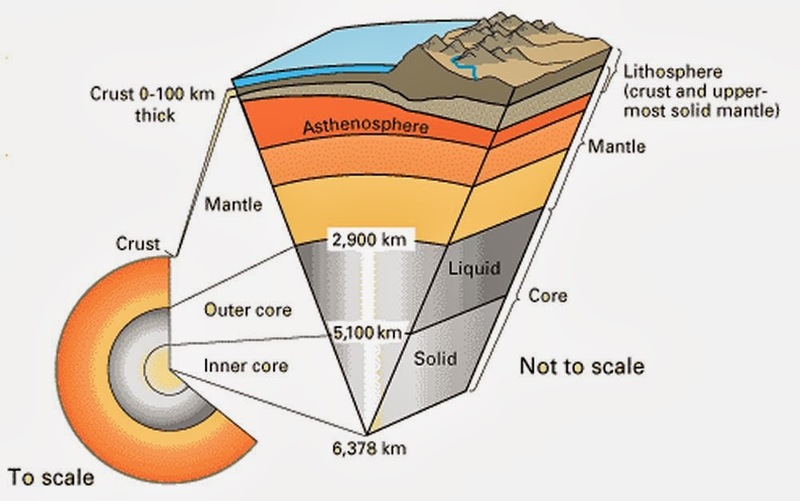 By 3.45 bya, still in the Archean Eon, Earth’s metallic core was stable enough to initiate a magnetic field. This was a very important event. The metallic core is divided with the solid inner core at 1,250km/778mi thick (about the size of the moon) and the molten outer core at 2,200km/1,367mi thick. What makes the inner core a crystallized solid is the intense pressure reaching 345 GPa. That is incredibly a lot of pressure. ‘G’ stands for giga (billion) and ‘Pa’ is for Pascal, an international measurement of pressure. One GPa is 1,000,000,000 (billion) pascals and while 101.325 pascals are equal to 1 atmospheric pressure (atm) 345 GPa is 3,450,000,000 atm. This pressure increases in magnitude iron’s melting point and equivalent to 45,000,000 psi, the metal crystals are forced to vibrate in situ as a solid. Extreme heat is at play here too. In the inner core, the temperature range average is 5,430 °C or 9,800 °F with long play peaks at 6,093.33 °C/11,000 °F along the inner/outer boundaries, which is hotter than the surface of the sun. 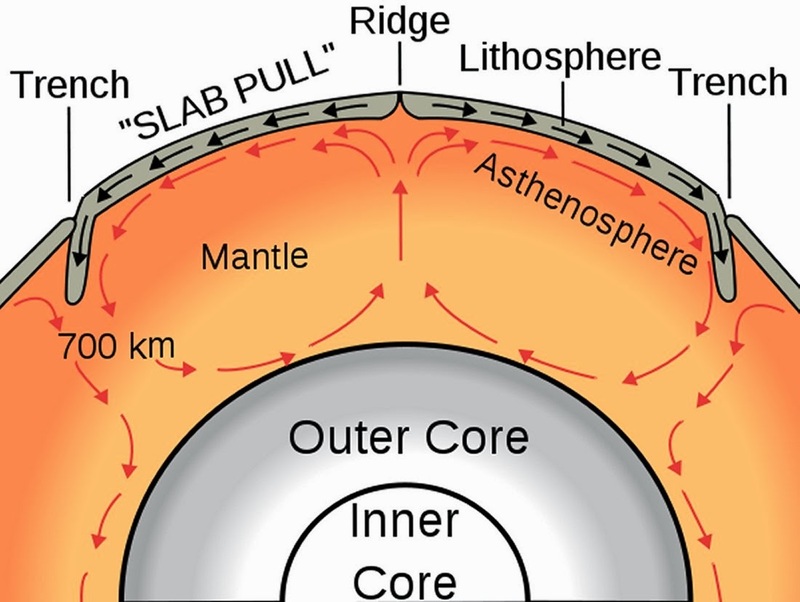 Inner core heat dissipates into the outer causing the solid inner core to creep into the molten outer core growing the inner core about 1cm/0.4in every thousand years. Heat from the outer core is further dissipating into the mantle making it a very viscous molten consistency of elemental, mineral and rock material. In the mantle is where most of Earth’s heat is stored. All this original core heat has been induced by several factors where dense metals attract and absorb heat more readily than insulated material. Expansion of the inner solid core generates negligible latent heat much like liquid water giving up heat in turning to ice. Extreme pressure from the original buildup of gravitational friction has played a 5-10% part in generating heat. The vast majority of heat, at least 90% of it, is fueled by radiation decay of radioactive isotopes such as Uranium-235, 238 or plutonium-40. In a radioactive isotope’s quest for stability, heat is released as it sheds energy. All this heat transference from the inner core, along with Earth’s rotation causes the outer core’s molten iron to move. These rotational forces acting upon the molten iron leads to weak magnetic forces about the earth’s axis of spin. Along with the dynamism between the inner/outer core boundaries with a more fixed resistant flow versus a more turbulent flow, electrical charges are set in motion producing a weak magnetic field. 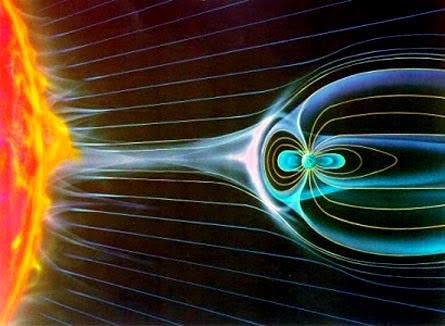 The magnetic field being configured was crucial in protecting surface quantities that were to be the seeds of life. Solar winds, being ionized gases of charged electron and proton particles blowing outward from the sun at 400km/248.55mi per second, would erode early Earth’s atmosphere and dissipate water vapor out into space. The winds would also sweep away the ozone protective layer allowing much more intense solar UV radiation to bathe the earth’s surface that would have been biologically too damaging. This is what appears to have happened to the current Martian low barometric atmosphere where there was evidence of once vast amounts of surface water, but virtually not a drop today. Another critical aspect of the core heat was Earth’s internal movement. Core heat began influencing convection currents on the viscous mantle. Heat traveling from core to mantle not only turned material into a viscous state, the radiating heat also created movement. The semi molten mantle was and is a consistency of thick glue, but composed of a myriad of material. It is a witch’s brew being stirred ever so slowly with the bulk consisting of rock forming silicates, water vapor, various elemental and compound gases such as boron (B) and mercury (HG) as vapors, noble gases in a hybridized pyroxenite fluxed state, carbon dioxide (CO2), carbonates (CO32-), hydrogen sulfide (H2S) and elements such as sulfur (S) and metals. The mantle ranges from 7km/4.35mi to 3,961km/2,461.25mi in thickness. As the heat disperses throughout the mantle it cools as it rises, this in effect promotes heated movement as the denser material cooling above begins to sink back into the bottom of the mantle. This creates a circulation of convection movement. 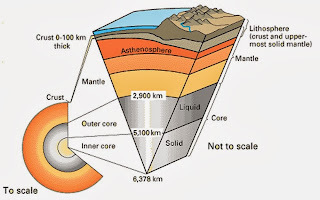 Just as the solid inner core creeps into the liquid outer core at their interface, so too does the mantle solidify in a thin layer between it and the earth’s crust. The earth’s crust is composed of solidified mantle material that is enriched in silicon dioxide (SiO2) rock material, such as andesite and is transformed into various mineral compositions of igneous, sedimentary and metamorphic rock. The crust also contains the bulk of Earth’s incompatible elements within continental (land) crust and basalts within the oceanic crust. Contributing only to ~0.473% of Earth’s total mass, the crust is rather thin from 5km/3mi in oceanic crust to 50km/30mi in continental crust. Between the upper reaches of the mantle and the belly of the crust is a region of magma under a state of molten liquid. In having liquid form sandwiched between two solids, the liquefied material is under intense pressure. Magma is composed of mantle/crustal interchanged molten solids, dissolved gases and some heat resistant crystals such as zircon. Crustal material has elasticity and behaves much like semi-plastic. Rock material under stress though, does crack and breaks when strain reaches fracture limits of the material under intense pressure and heat. With a thin crust, rupture zones indeed commence creating fissures, vents and volcanism that release immense amounts of lava (the molten solids of magma) onto land and liberated gases into the atmosphere. Intrusions into adjacent rocks with pressure opening up fracture sensitive zones also are avenues for lava extrusion. From this, the original atmosphere of hydrogen and helium did evolve into other percentile gases from Earth’s own mechanics utilizing the bombardment materials from outer space, with the core’s engine generating the heat necessary to fuel the process. A complexity of events that took hundreds of millions of years to conduct, we now know all today was not created as from a day one of creation. Today’s roughly 75% nitrogen/25% oxygen atmospheric ratio also had to evolve. This recycling of material between the mantle and crust is biologically very important. Earth’s angle of rotation allows all points of Earth’s surface to be showered in sunshine. If there were only zones of spreading new material, the Earth’s surface would only grow deforming its point of rotation about its axis severely affecting overall sunlight exposure keeping certain regions in permanent shade. It could also wobble Earth outside its current orbit. Just a few degrees closer to the sun the earth would scorch and likewise, a few degrees distance further, the earth would freeze. With only subduction zones gobbling up crustal material the dynamism of Earth would essentially be dead with no new influx of material. All orogeny would erode down to plains and below sea level. There is still another influence of the mantle’s convection currents on the crust…continental drift. Land masses we deem as continents are essentially islands riding atop tectonic plates comprising the crust and upper most solidified mantle in a zone called the lithosphere. The word lithosphere is derived from ancient Greek meaning rigid rock. Tectonic plates in turn ride on the back of the rheological viscous upper mantle. The major source of plate movement is powered by the geodynamic mechanisms of convection currents. This involves complex mechanical processes in the differences between the solid and rigid lithosphere along with the prone to flow rheology of the mantle. Also with the lithosphere, heat is lost by conduction while heat is transferred by convection from the upper mantle. The upper most portion of the upper mantle is known as the asthenosphere. The asthenosphere is mechanically weak and readily deforms under tensile stress. This characteristic is known as ductility and is dependent on pressure and temperature. The element gold (Au) is high in ductility. In transferring heat by convection, along with its highly viscous material, the asthenosphere has an adiabatic temperature gradient. An adiabatic process can be very complex and for purposes here we will not go into hardly any detail. If there is any further enthusiasm for a few, the graphic below might be of some interest. 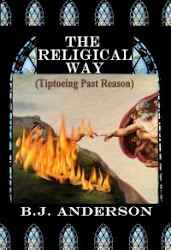 To be brief, before we steer completely away from our main thoughts, we usually think of flames deriving from burning organic material such as wood or gas in oven ranges where a constant pressure adiabatic flame temperature is confined to a narrow range of 1950 °C/3542 °F. This is due to the stoichiometric combustion of organic compounds where carbon materials break down from C-H, C-C and 1.5n O2 bonds to CO2 and H2O bonds. In open air there is no confinement and as a result, the burning organic substances decompose at a constant pressure allowing the resultant gassing to expand. Beneath the earth, it is an entirely different environment. In the boundaries of the lithosphere and asthenosphere, the constant pressure adiabatic flame temperature (although there is no actual flame without sufficient oxygen) results in complete combustion occurring without any heat transfer or changes in energy whether potential or kinetic. Therefore, temperature is lower than the constant volume process due to energy utilized to change the volume system, or in other words, as in the first law of thermodynamics…generate work. As opposed to an open air flame known as a diathermic wall where facilitated environment is conducive to transferring energy, within the earth an adiabatic wall is one that halts any transfer of energy from one body to another, acting essentially as prime insulation. This is the driving force of the convection currents within the mantle in maintaining energy levels and not dispersing it out through the crust. There are secondary forces as well that play minor roles in the convection currents’ effects on plate tectonics. Tidal drag from the sun and moon’s gravitational forces exerting on the crust is one. Others are basal drag driving plates by friction, shear strain due to the N-S compression exerted on Earth’s rotation, subduction drag, gravitational slide spreading and even the Coriolis Effect plays a minor role. At the beginning of the Archean Eon, Earth’s heat flow was three times what it is today and was two times that when the Archean Eon ended. But Earth did cool down enough to form a thin crust during the Archean Eon, though there most likely were incomplete pockets of persistent lava. Convection currents began 4 bya and plate tectonics were well in place by 3.5 bya being similar to that of modern Earth. There are seven major plates, but while depending on interpretation of a definition, there are eight major plates with numerous minor ones. Lateral relative plate movement ranges from 0-100mm/0-3.94in annually, while plate motion ranges from 25mm/0.98in per year (which is about the same as fingernail growth rates) to 160mm/6.30in per year, which is about the rate of hair growth. Where plate boundaries meet, geologic forces take hold and with specific characteristics are descriptively named due to their nature. When two moving plates converge on their borders and the one most dense and heavier is forced underneath (subduction zone) or two with similar densities collide (continental collisions) pushing upwards are all classed as convergent boundaries. Convergent boundaries are destructive in that the hydrous minerals in the subducting slab release superheated water melting the mantle forming volcanism. Continental collisions are a variation event where subduction has been halted with force pushing the two plates upwards as they converge into one another, or one plate in its movement is forced upwards against a stationary plate as exemplified in reverse faulting processes. Being constructive, the opposite is divergent boundaries where the two plates slide apart from each other in mid-ocean ridges and in oceanic or continental rifts. Transform boundaries witness two plates grinding (not ‘sliding’ as is usually the misnomer description) past each other as transform faults. When the relative motion appears left sided it is considered sinistral and when moving right is said to be dextral. Transform boundaries are conservative where much potential energy is stored as movement is locked up in the uneven and serrated edge plate borders. 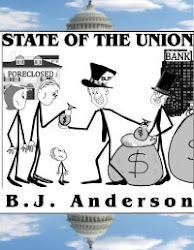 Once the continual push for movement by the locked plates finally overcomes the friction holding back motion, the sudden release is known as an earthquake as is the case in the San Andreas Fault line and its numerous tributaries. Continental drift driven by plate tectonics always makes us think of Pangaea as the first continent mass, but that assuredly was not the case. Composed of ancient crystalline basin rock, a craton found in the interior of tectonic plates are very old and a stable component of the continental lithosphere. Cratons are thick crustal portions of the lithosphere sending lithospheric crustal roots deep into the mantle. Essentially cratons are humongous rock cores formed from cooler mantle regions and as insulated from magma melt permitted thick volcanic accumulations to generate voluminous partial melt low density felsic rock. Felsic cratons first appeared in the Archean Eon and lead to the first proto-continents. Though much smaller than any of today’s continents, the first very probable small supercontinent to appear was Vaalbara ~ 3.35 bya. Vaalbara was once a whole craton that is now split with one half from the Kaapvaal region in southeastern Africa and the other half in Australia’s northwestern Pilbara region. Rock from both these regions is identical as once being from one craton source. The small continent Ur was formed 3 bya, but lingered hundreds of millions of years as Earth’s only continent surrounded by a few micro islands. The whole continent of Ur survived intact even after the new continent Pangaea engulfed it. Ur’s survival rate deems it as the oldest living continent and perhaps so forever more. Ur’s current locations are obscured in Australia, India and Madagascar. Much larger than Vaalbara or Ur, Kenorland formed around 2.7 bya. It comprised the core of present day Canada, the United States and Greenland, today’s Scandinavia and Baltic region, western Australia and the Kalahari Craton which is in the current desert of southern Africa. It most likely floated along the equator. The first true supercontinent with a landmass roughly around 50 million square kilometers/19.305 million square miles was Columbia. It existed from 1.8 bya to 1.5 bya and determined through physical geological and paleomagnetic evidence encompassed the Ukrainian and Amazonian Shields, Australia, Siberia, North China and the Kalahari Craton. Existing between 1.1 billion-750 million years ago (mya), the supercontinent Rodinia evolved out of the sheared and dispersed pieces of Columbia along with new uplifted dry land masses. 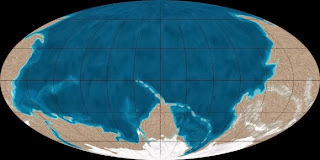 Columbia remnants then merged with the newly formed craton and shield dry land masses to form an enormous supercontinent that took up the majority of Earth’s surface south of the equator. Rodinia rifted apart into three continents being proto-Laurasia, the Congo Craton and proto-Gondwana. Rodinia’s breakup is critical to Earth’s historical course in its evolutionary sequencing. Up to Rodinia’s existence, life was teeming in the oceans, but was all devoid on land. The supercontinent’s breakup created much shallower oceans for that transition to actually take place. Rodinia’s severing apart also created extensive volcanism that fed the oceans and lands with super enriched mineral nutrients. There is some evidence that shows there was a continent formed when proto-Laurasia rotated southward towards the South Pole while proto-Gondwana rotated counterclockwise. In between the two proto-continents, the Congo Craton drifted through causing some glancing collisions creating a temporary supercontinent known as Pannotia 600 million years ago. There was no true emergence of the continents and by 540 mya, the short-lived Pannotia of 60 million years disintegrated into the four continents Laurentia, Gondwana, Siberia and Baltica. But with so much landmass around the South Pole, Pannotia left its indelible mark in evidence showing the most extensive glaciation Earth has ever experienced. Finally, the supercontinent Pangaea was formed when the continents Laurasia, Gondwana, Siberia and Baltica merged together 300 mya. Much evidence has been gathered on the existence of Pangaea from lack of diversity in fossil evidence as life had already occurred on land by this time and oceans were not separating species enough to diverge through natural selection. Shared paleomagnetic minerals, matching geological trends between the eastern coastline of South America and the western coastline of Africa and matching glacial till found on the current continents that identically match verifies an original source. With three major phases in the rifting apart of Pangaea, the first phase began 175 mya when Pangaea began rifting from the Tethys Ocean opening up the North Atlantic and later the South Atlantic forming the Atlantic Ocean. The southwest portion of the Indian Ocean opened up separating Madagascar from India and supplanting it on the African plate marginally as an island adjacent to East Africa. The second major rift phase occurred on average 145 mya splitting Gondwana into multiple continents known now as India, Antarctica, Australia, Africa and South America. A subduction zone known as the Tethyan Trench, sucked in the Tethyan mid-ocean ridge that was once responsible for the broadening of the Tethys Ocean’s expansion. The subduction zone also pushes Australia, Africa and India northwards. South America and Africa separate. The final third phase occurs 65-50 mya and splits Laurasia into halves separating Greenland and North America (together known as Laurentia) from Eurasia creating the Norwegian Sea. India began colliding with the Asian continent 35 mya forming the Himalayan orogeny and closing off the Tethys seaway. The Himalayan mountain system is still going on today along with the rifting in the Red Sea Rift and East African Rift. Geologic history bears out that supercontinent emergence and separation is cyclical occurring roughly every 250 million years. Below is a video that reconstructs the forming of continents from the remnants of Rodinia 400 million years ago to the supercontinent Pangaea, Pangea’s deconstruct to the present and continues constructing a possible model in the future 250 million years from now. It is interesting to watch. 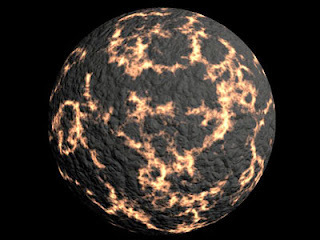 During most of the Hadean Eon, primordial Earth was smaller but building in mass due to the heavy bombardment periods. Water molecule vapors and the original hydrogen and helium atmosphere would have escaped Earth’s gravity and atmosphere leaking out into space. The Theia impact vaporized rock sending it into the atmosphere where it condensed with the solids falling back to Earth within 2,000 years. This left behind the hot volatiles in the atmosphere which resulted in heavy carbon dioxide and water vapor measurements that had originally escaped as steam billowing out from inside Earth. ~ 4.2 bya nearing the end of the Hadean Eon there was a cooling off period for several 100 million years. This was due to the original planetary accretion period’s heat dissipating with a period of a much lessened influx of bolides. Bolides are simply meteoroids and asteroids with an apparent magnitude > -7 in brightness and are enough in mass to leave craters on impact. The onslaught of comet and hydrated asteroids brought about half of Earth’s water adding to the amount that was originally trapped during protoplanetary building, but the lack of their impacts allowed heated water vapor to cool, condense and fall down to Earth. And raining down it did for thousands of consecutive years forming the oceans. Gradual leakage of water in hydrous minerals occurred at a great extent during the earth’s cooling from a molten state and still occurs at some degree today. The Earth’s surface still at 110 °C/230 °F during the cool off was not enough to offset liquid water into vapor states due to the high atmospheric pressure of carbon dioxide remaining in the atmosphere. Crustal formation is much like the core/mantle formation where the lighter silicate material formed higher altitude land features and the heavier basaltic material sunk forming huge basins. With plate tectonics kicking in, orogeny had begun in uplifting further the continental land masses, while condensation began filling in the basins. Zircon crystal studies bear out liquid water had been collecting on the surface as far back as 4.4 bya. By the time the Archaen Eon had come 4 bya, oceans had formed but were acidic. This was due to the amount of carbon dioxide filling the atmosphere where: CO2 + H2O ═> H2CO3 (carbonic acid). Carbon dioxide was also being pulled from the atmosphere by the crustal portion of the lithosphere under water forming calcium carbonate: H2CO3 + Ca++ ═> CaCO3 (limestone). Fresh rock rich in calcium provided from plate collisions became a storage reservoir of carbon dioxide by depleting it from the atmosphere and utilizing the gas as a sink in sediment building. Due to this, over the last 200 million years atmospheric carbon dioxide concentrations have dropped. Sea water as salty came about due to the nature of pure water and the chemistry of minerals that dissolve in it. Dissolved seawater solids originated from two key sources. Erosion and chemical weathering of rock on land was transported out to the oceans by rivers and their tributaries. The earth’s interior has also contributed to oceanic water solid content by means of hydrothermal vents. Also, volcanism spews particulate matter up into the atmosphere that eventually is carried down to the oceans by precipitation (rain, snow), down winds or gravity. Although virtually every element can be found dissolved in seawater, only six ions compose over 98% of solids. Of those six ions, sodium and chloride account for 85%, which is why seawater tastes like the sprinkled salt on your tomato. Analysis of 4 billion year old Acasta Gneiss from the Slave Craton in the Northwest Territories of Canada validate that oceans and continents had formed prior to the Archean, but by the midterm of the Archean Eon, Earth had an established atmosphere and ocean. Continental land masses also had running water as shown from direct evidence of Greenland’s 3.8 billion year old sedimentary rock deposited and laid down as layered sediment from running water. The hydrologic and sedimentary cycles were in place by the early Archean. As viewed from above though, the Archean Earth would not appear as oceans of blue with white clouds dispersed in the atmosphere. With turbid waters, the oceans would’ve been gray underneath a red tinted sky due to the then composition of the atmospheric gaseous makeup and percentiles of each. Though virtually no mountain orogeny or volcanoes exist today from extensive Archean volcanism, remnants of this eon’s volcanism can be studied from mostly flat continental cratons. The extensive Archean volcanos spewed out vast amounts of water steam, carbon dioxide, sulfur dioxide and a fair amount of methane and hydrogen sulfide that along with the free nitrogen, became the bulk of the eon’s atmosphere. Methane droplets suspended in air shrouded the earth in that reddish tint global haze. No more than 3% of the atmosphere contained oxygen as most free oxygen had been taken up into compounding water. Grain analysis from rock formed during the Archean show a reducing atmosphere and not an oxidative state that was to first appear at the very end of the Archean. In ending this segment with a paradox, 3 bya the young sun was only 70% as bright in magnitude as it is today and Earth should’ve frozen snuffing out any chance for life to grab a foothold, but there was no freezing. Why? Because at this time methane and carbon dioxide levels were up to 10-200 times more per unit concentrate than they are today. These greenhouse gases trapped enough of the sun’s heat to keep the Earth’s surface temperatures above freezing. Food for today’s thought. After the oceans and atmosphere were forming between the Hadean and Archean boundary, great amounts of carbon dioxide was taken out of the atmosphere and locked up into carbonate sediment by the vastly growing, but no less efficient ocean waters. Though there was an appreciable amount of methane left, this left mostly nitrogen as the bulk of atmospheric gas. Today, cells within a living body require basically three functions. One is the concentration of monomers, enzymes and proteins to act as a wholesale energy source. They also require the removal of free oxygen and hydroxyl radicals as waste. Thirdly, access to prebiotic or biotic monomers to form genetic polymers existing in a steady state but far from equilibrium is key to existing life. How did all this come about? Let’s attempt to describe the sequence. Rapid chemical synthesis of available raw materials in the atmosphere begin producing amino acids, which are strictly what they state they are…a compound containing an amino group (-NH3) and a carboxylic acid group (-COOH). All naturally occurring amino acids have a mirror left/right image. Known as enantiomers, these mirror images though are not identical, but because they can form as two distinct mirror images around a central carbon atom, they all, except for glycine, occur in two isomeric forms. This is due to the lack of plane symmetry in the amino acids, so in effect are stereoisomers as opposed to mono. These isomeric forms are called L and D analogous to left handed and right handed configurations. Both L-amino acid and D-amino acid stereoisomers have been found in meteorites, which surely brought them to Earth during the early bombardments, but only L is utilized in any organism’s synthesis of proteins, where D-amino acids are relegated to minor functionary roles such as membranous wall building. 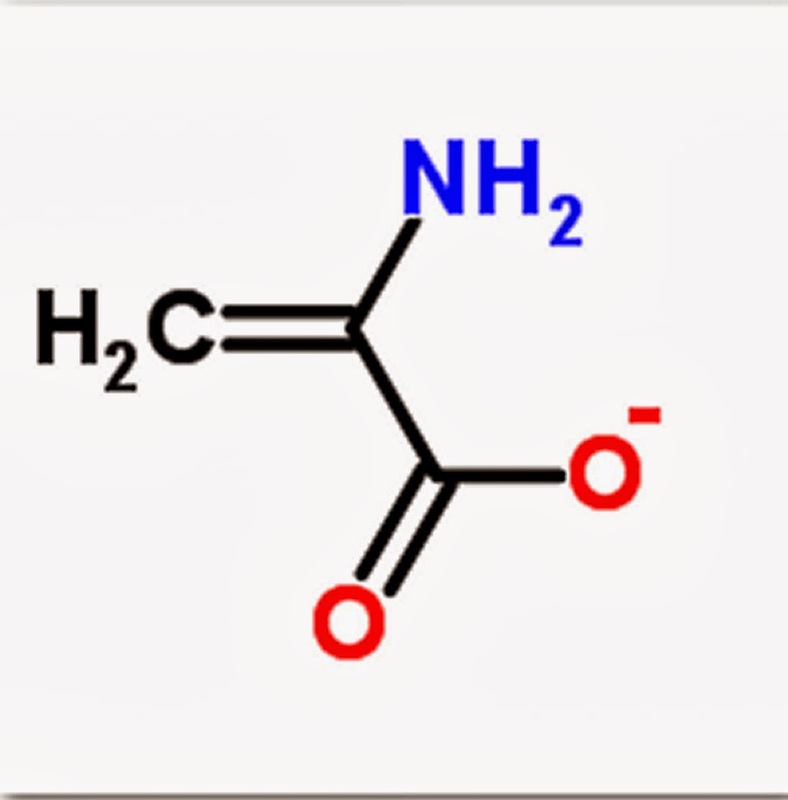 However, D-amino acids later become vital to nucleic acid as DNA having D-ribose sugars. 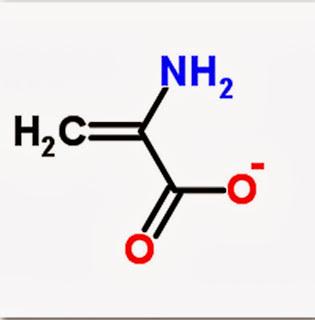 The synthesis of available chemicals into amino acids and the borrowing of amino acids from bolide contributions gave the existing oceans’ monomers a foundation to build from. Mono means one and mer is a structural unit, so monomer means one structural unit. Polymer where poly means more than one needs to come about by monomers adhering or polymerizing into repeated structural units. During the Archean Eon we have soluble amino acid monomers loosely mixed in solute with the existing oceanic waters. This is important for the ocean waters protect the amino acids from UV photon disruption and creates an ease of interaction pathways. The gravitational tug of the sun/moon on Earth’s oceanic tides creates zones of evaporate silicate clays along the coastal shorelines. 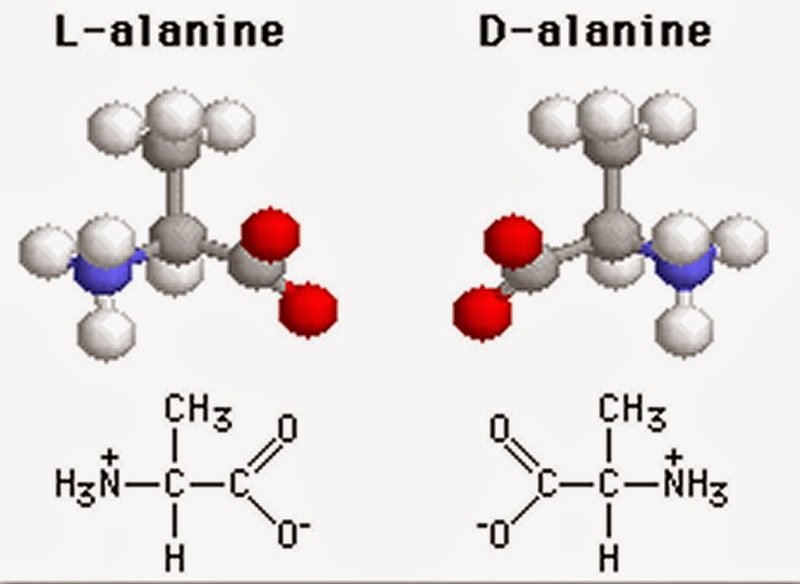 The clays’ valence charges collect the amino acids. Heat from expelled lava warms the coastal waters. Tidal pools form concentrating the amino acids. All this allows the concentrated amino acids to polymerize. Within a range of 55-85 °C/131-185 °F, warmer waters were conducive to polymerization of the amino acids into peptide chains. The silicate clays, favoring L-amino acids act as a catalyst. The clays perfunctory role was acting as an adsorption median to the activated amino acid monomers’ enhanced polymerization and did this by increasing monomer concentration orienting them in favorable condensation during the process. Even in thermodynamically unstable conditions, kinetic traps, which define the rate at which a chemical reaction occurs, would accelerate processes to produce chemical bonds between monomers. As these organic peptide polymers concentrate themselves, under lab conditions they separate out from the liquid media they were suspended in as individual droplets. This leads to a proto-cell (analogous and a precursor to, but not quite yet life) embroidered with long chain molecules acting as a membrane allowing the proto-cell to become anhydrous. Within the proto-cell, a monosaccharide (simple) sugar was trapped. This sugar was ribose that was abundantly produced in an environment of UV, heat and lightning synthesizing its abundant and basic building blocks of carbon, hydrogen and the available free oxygen into the sugar’s chemical formula C5H10O5. Efficacy of enzymes performing as catalysts is far more efficient than simply clays with a silicate surface. The common bond between all today’s biotic enzymes is centered on the primitive pyridoxal phosphate dependent stabilization process of α-aminoacrylate or α-aminocrotonate. As you can see from the figures below, both amino groups either have a nitrogen or ammonium base which was readily available during the Archean. Phosphate is an organic based molecular building block. So, the first synthesized enzymes allowed an abiotic proto-cell membrane to catalyze basic synthesis. It also may have led to deleterious synthesis erupting into a metabolic state such as the product of indole condensation with α-aminocrotonate. These first enzyme mutations were the precursors to genetic mutations. Interstellar and circumstellar molecules in the ocean’s organic rich mix were formed which in turn generated straight chained fatty acids through the synthesis of carbon’s isotope C9. With an abundance of presolar organic and inorganic precursors, aldehydes, ketones and with hydrogen cyanide (HCN) in the presence of ammonia (NH3), were already amalgamated as the synthesis in the building blocks of biochemical compounds. Cometary iron/nickel grains could’ve easily catalyzed the formation of complex long chained fatty acids. Primarily from phosphatidycholine, fatty acid chains could have been converted into liposomes and encapsulated into the proto-cell amino polymers. Vesicles are small bubbles within a cell enclosed by a lipid by-layer, therefore can be considered an organelle. Fatty acid growth began within the proto-cell through two distinct pathways: one through the incorporation of fatty acids from added micelles and growth through fatty acid exchanges between vesicles. The fatty acid chains acting as the membrane were permeable enough to facilitate charged polar molecules such as ions and nucleotides. Amphiphiles, first brought to Earth by meteorites are chemicals that possess both hydrophilic (water loving) and lipophilic (fat loving) properties. This led to a transient complex that allowed mixtures of amphiphilic molecules to enter osmotic membranes composing a vesicle’s assemblage. Large chains of amino acid residue began forming a sequenced macromolecule that became a protein and with the amino acids in sequence began replication. Higher levels of modified nucleotides reached the threshold in the homogeneity required to produce nucleic acid. With ribose sharing duty with phosphate in serving as a backbone, they bonded to the nucleotides adenine, cytosine, guanine and uracil. Ribonucleic acid (RNA) had been polymerized with its first important role in synthesizing proteins as enzymes. Further, an outreach of RNAs would independently serve as a catalyst for chemical reactions. This class of RNAs is designated as ribozymes and was just discovered in 1989 by Sidney Altman and Thomas Cech earning them the Nobel Prize in chemistry. A glorified ribozyme known as a ribosome became a large molecular complex that assembles proteins to perform a vast array of functions from reproducing RNA to responding to stimuli. Most likely the original ribose sugar was not in enough abundance to form long polymerase strands and there weren’t biotic enzymes yet strong enough in efficacy to catalyze the long single strands. However it has been verified through lab experiments that in the absence of enzymatic catalysts, single stranded RNA can copy strands of itself through template-directed polymerization. This process has been shown to be slow and prone to error in which may have forced the proto-cell to come up with more proper duplication, hence the process explained from the above two last paragraphs evolved. Also, lab trials have proven that long strands of RNA can form in salty icy water. A dilute solution of chemically activated RNA nucleotides causes nucleotide concentrations while ice crystals are forming resulting in the formation of long strands of RNA. With a culmination of a myriad of chemical and geophysical processes, life had introduced itself on Earth. Assuredly there was multiple trial and error periods with a frequent hit and miss combination as life did not first appear until well after 100s of millions of years had passed since the first oceans and atmospheres formed. Once the proto-cell began replicating itself, RNA as the precursor to DNA’s origins, life was introduced to Earth. As far back as we can go through fossil records, life first formed 3.8 bya from the proto-cell as Archaea, a microorganism no larger than 0.1 micrometers. Archaea have no morphology to leave fossils, but they do leave chemical fossils of lipids unique only to their kind. Very tiny in size as the first species of life, but was humongous in size as the frontrunner to what life was to evolve into and out of. 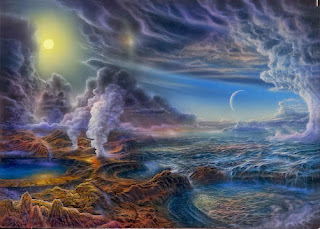 So life began on Earth. Coming later, the third segment of ‘Et Tunc Nulla Erat’ will begin to trace the evolutionary tale of life. The above episode of Earth’s geological history was not expounded on. Each segment, even at times each paragraph could have been only explained completely in book form. Hopefully some insight if not some knowledge was gained here for the brave reader that read on through and hopefully it might have spurred some interests. You may have noted there were times during your read that the name Earth was capitalized and at times it wasn’t. Earth is a proper planetary name and as in all planet names, such as Venus or Neptune it should be capitalized. But for the mere fact Earth is used much, much more from technical papers to laymen editorial excerpts, we have forgiven those that do not capitalize Earth, but only after it is followed by the word ‘the.’ So, Earth is Ok, but the earth is also okay as well. The video below is not an in depth recap, but does tie a few things together that was discussed in this article.